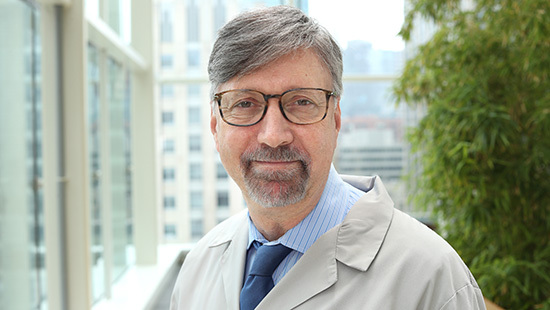 The Division of Gastroenterology, Hepatology and Nutrition at Northwestern University Feinberg School of Medicine’s Department of Pediatrics, through its partnership with Ann & Robert H. Lurie Children’s Hospital of Chicago, is dedicated to education, research and patient care related to children with a wide array of liver and digestive disorders. Division faculty participate in our comprehensive, full-service clinical programs that cover all the relevant subspecialty areas of the field. 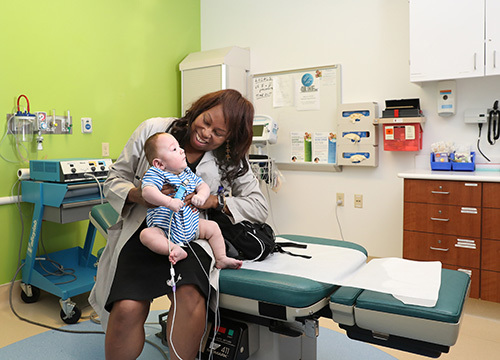 "Our division is focused on providing state-of-the-art care for children with wide range of complex conditions, and we are committed to advancing the science and understanding of disorders of the GI tract and liver. We are proud of the fact that our division is one of the premier clinical and training programs in the country." 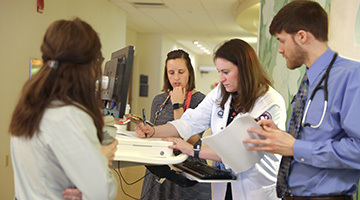 Ranked eighth in the nation by U.S. News & World Report for Pediatric Gastroenterology and GI Surgery, the division is comprised of the clinical faculty and multidisciplinary healthcare teams made up of nurses, nurse practitioners, fellows, residents, dietitians, clinical psychologists and social workers. Our team saw more than 14,000 outpatients last year and performed nearly 2,000 procedures. 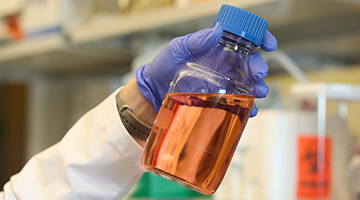 Three full-time scientists and the majority of our faculty are actively involved in state-of-the-art research to advance our understanding of digestive and liver diseases and develop new therapies to treat our patients. The Center for Intestinal and Liver Inflammation Research, led by Xiao-di Tan, MD, is a multidisciplinary group of investigators examining the basic immunological and inflammatory mechanisms behind digestive and liver diseases. A wide array of clinical research is also ongoing, looking as such diverse areas as liver transplant outcomes, therapies for IBD and short bowel syndrome, clinical aspects of functional bowel diseases and motility disorders and eosinophilic esophagitis and other allergic conditions of the bowel. View our publications feed. There are many aspects of gastroenterology and nutrition that are critical components for understanding pediatrics in general. As such, our division is dedicated to creating a learning environment that provides a foundation in these areas for medical students and residents and an in-depth experience for fellows. ACGME-accredited fellowships are available in Pediatric Gastroenterology, Hepatology and Nutrition and Pediatric Transplant Hepatology. Celiac disease is a prevalent condition characterized by an immunological inflammatory reaction that damages the intestinal lining and is caused by gluten proteins in the diet. Patients can present with a wide variety of gastrointestinal and non-gastrointestinal complaints and, if not identified and treated, can affect growth and development of pediatric patients. A lifelong gluten-free diet is required to maintain health. A team of physicians and nutritionists provide expert care for the diagnosis, monitoring of bone health and subsequent education and support to maintain a gluten-free diet. The Eosinophilic Gastrointestinal Diseases Program is devoted to the comprehensive care of children diagnosed with eosinophilic esophagitis (EoE), eosinophilic gastritis, eosinophilic gastroenteritis and eosinophilic colitis. The program is on the forefront of research, particularly in EoE, and is a major site of a national collaborative group called the Consortium for Eosinophilic Gastrointestinal disease Researchers, which is funded by the NIH as a multicenter effort to study these rare diseases. The Inflammatory Bowel Disease (IBD) Program at Lurie Children’s is a national leader in the care of this complex group of patients. The IBD program is a participant of the Improve Care Now network, a national consortium of programs dedicated to monitoring and development strategies to improve outcomes for patient with IBD. Lurie Children’s offers a coordinated team approach to optimize the medical therapy, nutritional support and, when necessary, surgical intervention. Jennifer Strople, MD, Jeffrey Brown, MD, and Joshua Wechsler, MD, provide a wide arrange of treatment options tailored for the individual needs of each patient and family, including the use of immunomodulators, anti-TNF therapies and the latest biological agents. The Liver Center at Ann & Robert H. Lurie Children’s Hospital of Chicago provides comprehensive diagnostic evaluation and treatment for children with liver disorders. Our physicians are national leaders in research exploring the mechanisms and therapy of pediatric liver disease and collaborate closely with experts across multiple sub-specialties throughout our institution to provide the most thorough and comprehensive care possible. Our program includes an internationally recognized Hepatobiliary and Transplant Surgery team who provide cutting-edge surgical therapies and liver transplantation. Under the direction of Lee Bass, MD, the Advanced Endoscopy Program provides state-of-the-art procedural techniques to diagnosis and treatment a variety of GI and pancreatic conditions. Along with routine endoscopy procedures, a group of highly specialized physicians maintain a 24/7 Bleeding Team to manage emergent GI hemorrhages. Techniques such as capsule endoscopy and push enteroscopy are also performed to help diagnosis/identify occult bleeding sites. The interventional team provides endoscopic retrograde cholangiopancreatogrtaphy and endoscopic ultrasound to examine bile and pancreatic ducts conditions. Our newest endoscopic procedure is called transnasal endoscopy (TNE). TNE is a procedure to examine the esophagus that can be performed in older children or adolescents with only local anesthesia to the nasal passages and back of the throat, avoiding general anesthesia. Lurie Children's Pediatric Intestinal Rehabilitation and Transplantation Program is the go-to program in Illinois for patients with short gut syndrome. 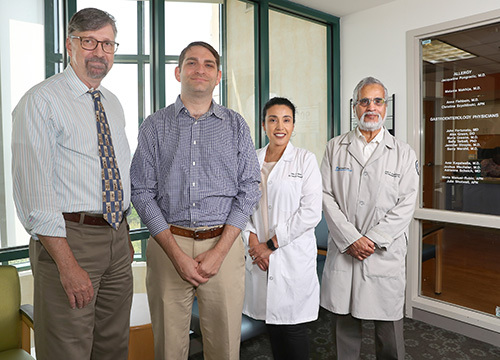 Valeria Cohran, MD, Joshua Prozialeck, MD, and lead surgeon Riccardo Superina, MD, work with dedicated APNs and dieticians to provide outstanding care for this complex patient population. The group excels at using innovative medical, surgical and nutritional rehabilitation strategies to promote growth and avoid severe organ damage that often leads to multivisceral transplantation.